Highland single malt anCnoc has collaborated with celebrated fashion designer and Great British Sewing Bee judge Patrick Grant in the launch of its latest bottling. 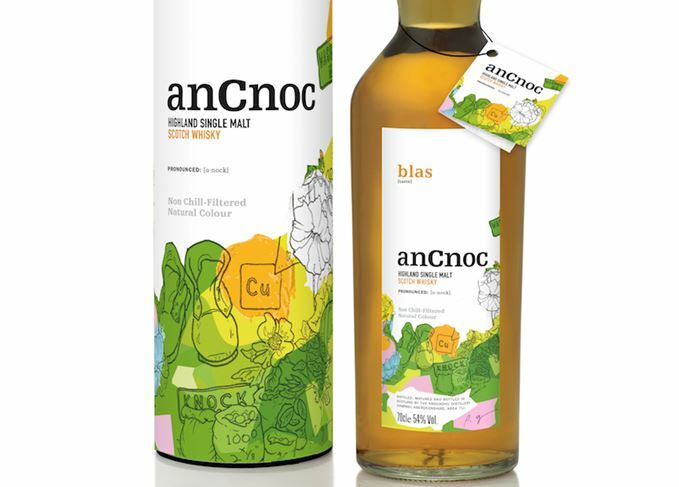 The limited edition whisky, anCnoc Blas, takes its name from the Gaelic for ‘taste’ and features a label designed by Edinburgh-born Grant, creative director of Savile Row tailor Norton & Sons and luxury menswear label E Tautz. A no age statement (NAS) single malt, it has been matured in American oak barrels and Spanish oak butts, and is bottled at 54% without colouring or chill-filtration. Grant, best-known as a judge on the BBC2 TV show The Great British Sewing Bee, spent over a year designing the print used on the label, which is inspired by the whisky, the Knockdhu distillery that produces anCnoc, the area and its people. Members of the public also contributed ideas via social media. ‘I spent a lot of time at Knockdhu, not only taking in the landscape and surrounding areas, but getting to know the people that work there and the methods that they use,’ said Grant. ‘Everything in the print is from the hill, the village of Knock or within the distillery itself, and tells the story of the making of Blas. The Patrick Grant Limited Edition, anCnoc Blas, retails for £50 for a 70cl bottle from UK independent and specialist retailers. Old Pulteney owner’s production investment is designed to underpin future international growth.